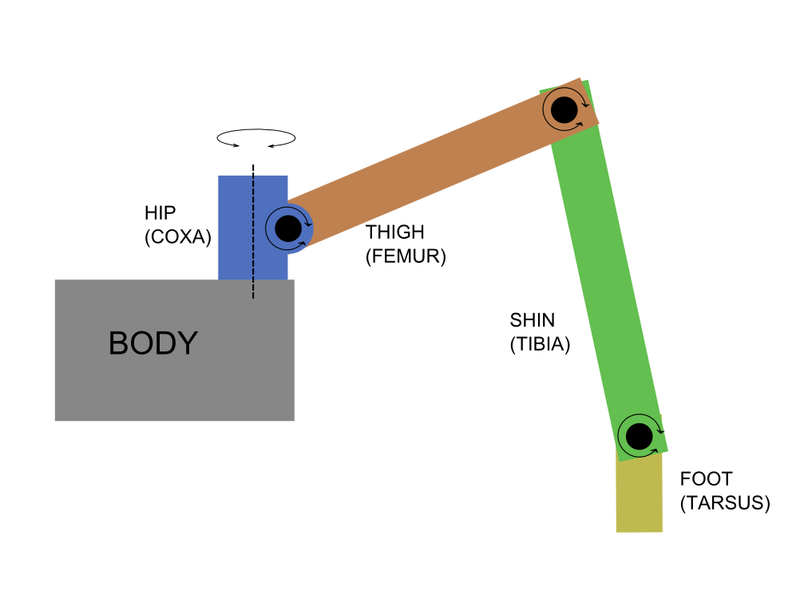 Here is (mostly for my own reference) a simple glossary for the parts that go into a very simple robot leg, with illustration. I prefer simplicity so I will use the names in English, while others will prefer the names in Latin. In my robot, there is no Foot, I just included that for completeness. Also this referece lacks any mention of joints or muscles (actuators). I simply lists the bones or "links". Anatomy of robot legg showing Hip, Thigh, Shin, Foot (Coxa, Femur, Tibia, Tarsus). Adding the actuators to my ODE model proved much harder than first anticipated. Even with all the stability-enhancing features of ODE cranked up to the max (really small step size, CFM and ERP set high, unit size bodies, masses etc.) my model completely explodes. I think the reason is that when I pose the model, it is not completely still, and the abrupt movement caused by the spike in error correction at simulation startup simply blows out of proportions. Open Dynamics Engine (ODE) exploded simulation due to instability. I will work on it some more before giving up on it. One idea is to engage the actuator bodies after the rest of the model has settled. Maybe assembling the model in zero gravity will help as well. But so far it is not looking good for this project. :-( I was hoping that ODE would play nice. I have used it a lot before, but then I mostly played with the collision detection and building large structures out of blocks to see how they would collapse, which ODE handled splendidly. I finally managed to coax ODE into accepting my IK rig. It was not easy, I can tel you that. The ODE documentation is a nightmare. I still haven't figured out why some of my code does not work. But I decided to leave it be and focus on what's more important. I have built the rig without actuators. 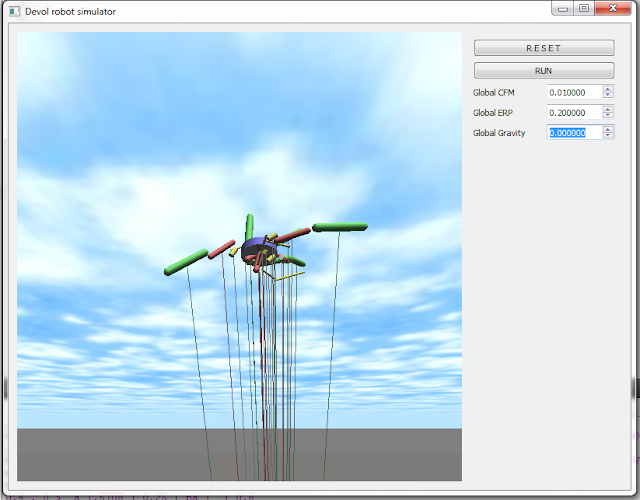 It runs in a simulator that draws out a simple representation of the world in OpenGL. I also have a Qt5 form where I can add some widgets to control the simulation as I go along. In the screen-shot, the robot is actually in free fall, because it becomes really unpleasant to look at after it lands. I have combed alibaba again. That site is really full of interesting prospects! This time I went looking for radio modems. The robot will have conventional WIFI and GPRS/3G/LTE access, but I thought that as a more general purpose, fail-safe and cheaper alternative (3G is expensive), It would be neat to have a FM radio on board. Just look at all the goodies! I made sure to hide my VISA card someplace safe first. After working with IKFast for a while, I realized that the OpenRAVE + IKFast combo is overkill for my purpose, and It might not do what I need/want. I wrote my robot definition in XML based on one of the examples, loaded it in OpenRAVE and all was dany, except that it was really hard to work with. I have instead shifted my effort to creating a custom software in C++ / OpenGL / Qt5 / ODE. The idea is to construct a model of the robot using ODE bodies connected with hinges, and then fit the model with linear motors in place of the linear actuators. The model will be constructed with realistic masses, sizes and motor speeds and torques in an environment with realistic ground friction and gravity. So this model will in many ways simulate a real hardware robot, with quirks and numerical errors in place. Then the next step is to write a layered stack of controller logic that only receive as input the physical properties of the robot such as the limb sizes, masses and so on plus the robot state in the form of linear actuator position readings and the actual position of the limbs in the simulation. By carefully crafting the logic in each layer of the stack, I can create a feedback loop that continuously "improves" the simulated state of the robot so that it resembles the desired configuration as much as possible. Each layer will have its separate well defined set of responsibilities and well defined interfaces to the neighboring layers, allowing for experimentation within each confined layer bu exchanging modules. 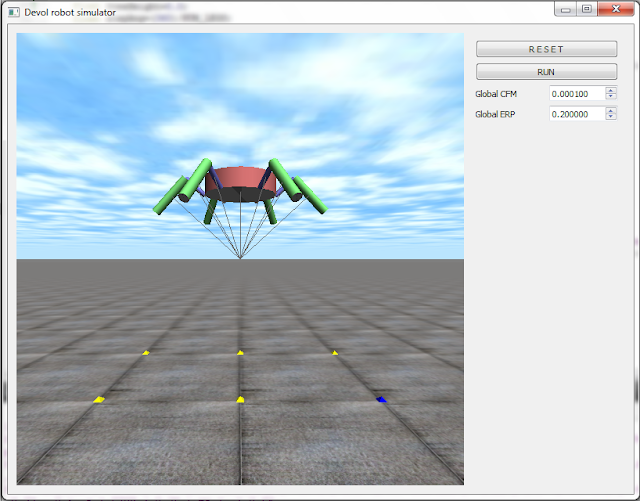 This model will most likely make the work of finding good parameters for the robot much easier. Trusting the results will be easier. For simplicity I have decided to keep all 6 limbs of Devol identical. Each limb will be interchangeable with any other. This I hope will make building and maintaining the limbs much quicker and cheaper due to reuse, but the design process might take longer because now I have to ensure that the one design i decide upon actually will work for all 6 legs. I have been thinking a lot, and created a 3d model for simulating the possible limb configurations. I have also managed to install OpenRave, and I have started learning to use it by adapting one of the example robot definition XML files while reading some of its tutorials on-line. 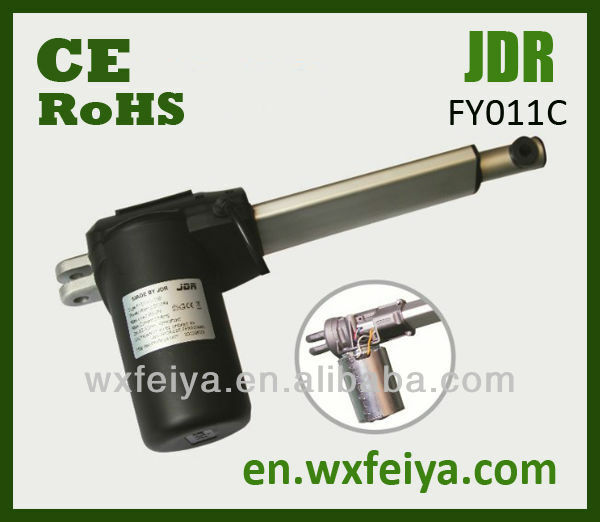 I have also looked at realistic actuators that might fit into the designs on global sourcing sites such as alibaba. For example I have received a quotation at 22USD per piece for 20pieces of this nice little actuator. Since I will need 18 of them, this is good news. The resulting robot will be more solid due to the separation of hinges and force in joints. Reaching higher precision in the actuators is easier than with geared motors due to the available flexibility of mounting positions. The actuators will actually be cheaper due to their outspread use in furniture. The actuators will remain static under load with 0 power drain. The choice of available actuators is huge with all sorts of quality, precision, speed and load requirements. But how can I calculate the required dynamic and static forces? I found this great site that appears to be centered around building another hexapod. They have a head start, I better shape up! Anyhow they made a series of tutorials, one which was very useful for my project, namely the PDF about simple hydraulics joints. I can warmly recommend it due to its simplicity and completeness.